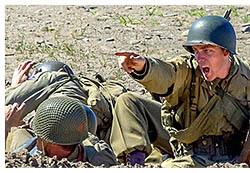 Experience the largest WWII reenactment in the US. Thank you for your interest in what has become the largest WWII reenactment in the country and the largest D-Day living history event in the world. Below you will find links and information relating to attending the event as a civilian or military WWII reenactor. Registration for all reenactors and vehicles, (civilian and military) is required. General reenactor registration opens May, 8th each year and fills up very quickly (within the first week typically) so register early. Registration is by invite. Please contact registration@ddayohio.us to find out how to be added to the invite list. Please read all Appearance, Safety, and General Regulations to be prepared for the event. Registration opens May, 8th each year and fills up very quickly (within the first few days) so register early. If you are new to WWII reenacting or in search of others, consider contacting and joining one of these units that frequent D-Day Conneaut. They are a wealth of information about the hobby and can be very helpful in advising what type of gear you will need and proper protocols. 1st SS LAH Panzergrenadier Div. Please remember that at all times during the battle (including travel on boats), spectators, camera crews, and professional video crews filming the event can observe and record your every action. Smiling, high fives, walking like your out for a Sunday stroll, and waving to the crowd takes everyone out of the moment. You are in a life and death situation; you actions, movements and expressions should reflect this. A typical spectator with a 300mm zoom or good pair of binoculars can see facial expressions of nearly every person on the field. Please put the same attention to detail into your actions as you have into your kits. Combat photographers and journalists served an important role in documenting the history of the invasion and took part in the events that followed the initial landing. As many units appreciate photos of their members in action, photographers are permitted with special restrictions. All persons in the drop/landing zone must meet the basic appearance standards described above. Historic photo equipment is required for use on the field as a uniformed participant. Unconcealed Modern Equipment is Not Permitted on the Battlefield! Modern equipment may be disguised using an empty vintage camera body. We seek to avoid marring an otherwise authentic scene with the painfully obvious sight of a modern camera being freely and openly brandished. Please keep in mind, veterans and thousands of spectators are watching and all-too-often catch modern cameras and cell phones in their photos. Still and motion picture photographers who participate in the beach landing are invited to send a link to a location where your photos are displayed. If you provide us copies we will be happy to post them on our website credited to you for all to view. Since this event involves a simulated beach landing, waterproof your gear accordingly. D-Day Ohio, Inc. is not responsible for any damaged or lost camera equipment or film. Please refrain from being tempted to take out your camera in the mists of battle. If you can see people, they can see you.... and your camera. D-Day has gathered a team of professional photographers who will be canvassing the event. Watch for our "guys in official photographer" shirts/uniforms. Images they collect will be proudly displayed in our online gallery were reenactors and visitors can order inexpensive professionals quality prints or digital copies. Sales of these prints help support this event. If you or your group would like to schedule a planned "unit photo", please contact our photography coordinator, Wayne Heim for more information. Commercial/professional photographers using non-vintage equipment who wish to request an inside-the-ropes access to shoot images for commercial usage should contact our official photography coordinator for information, fees and restrictions. COMMERCIAL VIDEO FEE IS REQUIRED ALONG WITH WRITTEN PERMISSION FROM D-DAY OHIO, INC. PRIOR TO SHOOTING AND USING VIDEO FOOTAGE FOR PROFIT OR OTHER COMMERCIAL PURPOSES. If you have additional questions or wish to obtain permission to commercially use video and/or images of the event in conjunction with the D-Day Conneaut name and/or Logo, please contact D-Day Ohio, Inc.. Permission must be obtained prior to the use of any of these materials and our name/logo. D-Day Ohio, D-Day Conneaut, and our subsequent logos are registered trademarks. Any use of those without express written permission is strictly prohibited. Boswell's Bicycles and Mission B.A.B.E. Nickerson Military & Sporting Collectibles, LLC.